Great anticipation is building as we come closer to Christmas Day. The old remember the happy times in their youth when families gathered to celebrate, and the young ones have hopes for the presents and blessings that will be exchanged. This is the one time of the year that many give gifts of charity to those who are financially disadvantaged, remembering God's manifold blessings. Others surrender their burdens and sorrows for the joy that comes with the knowledge that "a Child is born" to the world, a Child Who brings light, solace and peace into the farthest corners of the earth. In this time of the year, as we rush from store to store searching for the perfect gift for our love ones, let us remember that this is the season when the Church hymns out tidings of great joy announcing that Christ is born! "Christ is born; glorify Him! Christ comes from heaven; go to meet Him! Christ is on earth; be exalted! And praise Him in gladness, O people, for He has been glorified!" This hymn describes how Orthodox Christians joyfully give thanks to the gift of Christ's miraculous Incarnation. The hymn calls us to act in a very conscious and decisive manner. As Christians we live our Faith and witness it to the world through our gladness and joy; like the single light burning brightly in the darkness. This time of the year is also a time of humility, which today's society has forgotten with the commercialisation of this Christ-mass day. The Theotokos responded in humility when she consented to bear the Christ-child. 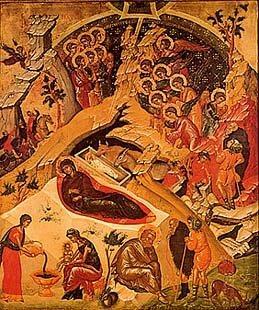 Christ chose a humble cave in which to be born and become Man. The shepherds bowed in reverence and humility to the newborn King. The three wise kings travelled vast distances to pay homage to a baby in a cave used to shelter farm animals. O, what great and moving images these thoughts build! We, like the foreign kings and pure hearted Theotokos, must respond to our Christian Faith in simple humility at all times, and especially now during the Advent Season. Christ's birthplace also reminds us that He depends upon each of us to welcome Him in our very homes, and to make Him part of our lives and families. Rejoice over the message of humility, life, love, and the hope that Christ's life offers us. Do not let your hearts be cold and stomachs sated with the lifeless material things gathered and food eaten. Lets celebrate the joy of the Nativity and extend our love to one another praying that the newborn Child blesses each of us. May the peace, love and joy of our Lord's birth shine brightly in your hearts throughout the coming year.